I have never understood game-hacking, because for me, if I’m going to spend a lot of time making something, I want it to be MINE, and I feel like the idea of hacking conflicts with that. Of course, that’s really a false dichotomy; things aren’t so simple and clear cut because inspiration comes from all around us. I may not set out to hack myself, but I can respect the fact that deliberate hacking is part of many larp communities and the indie gaming scene, and it’s something a lot of people enjoy. I have many friends and acquaintances who revel in a good hack, for whom it is a form of corrective love or just an awesome play experience. Surely, I thought, I must be missing something. 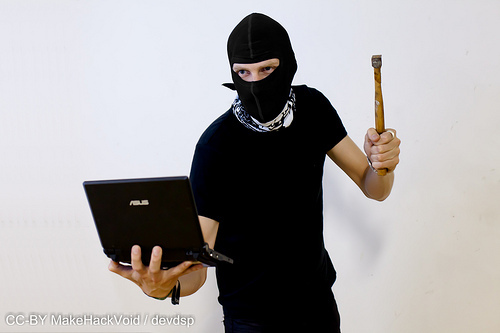 So I set out to unravel some of the ins and outs of hacking for you, dear readers. What is a game hack? It’s helpful to think of hacking along a spectrum. On one end you’ve got house rules, where a game master alters rules in a minor way to suit their group and style of play. A common one for Dungeons & Dragons, for example, is to make 19 and 20 both count as critical successes, rather than simply the latter. At the other end of the spectrum you’ve got stuff like Joe Mcdaldno’s Monsterhearts, about teen monsters in love, a game published in its own right and popular in its own right, but based on system from Vincent Baker’s Apocalypse World, or Martin Bull Gudmundsen and Ole Peder Giæver’s Itras By, a surreal 1920s cityscape, shares a simple resolution deck with Matthijs Holter’s Archipelago. Like most middles, the center of this spectrum is squishy, encompassing customized one shots, and probably a lot of other things I didn’t come across in my limited research. What are setting hacks and system hacks? A setting hack is what happens when you alter the setting for a game but leave the system otherwise intact. For example, Kira Magrann recently took the Norwegian high school larp drama Play the Cards by Tyra Grasmo, Frida Jensen, and Trine Lise Lindahl and did the work to transform it into a Game of Thrones larp. That sounded kind of awesome. A system hack is what it sounds like, I think–it’s a hack of the system of a game to permit different sorts of play. I don’t know too much about these, because while rulebooks have their place, they’re not my jam, so I don’t play games with strong systems very frequently. Isn’t hacking a game just like plagiarism? Not if you consider the movie Clueless plagiarism of Jane Austen’s Emma. There’s kind of a fine line between getting inspired by something and just lifting it, but in the indie community, at least, hacking seems to be like DJ dance sets–remix it, switch it up, and you’ve got something new. As indie designer Vincent Baker told me, “Game design is a conversation between designers. Monsterhearts, Monster of the Week, Dungeon World, the rest of them–they aren’t ‘hacks,’ they’re answers to Apocalypse World. And then, because game design has to be evident to be played, every game is an invitation to join the conversation. What makes a game more hackable? Nanogame and Dungeon Starter designer Marshall Miller suggests that a system that’s good to hack has three qualities. Firstly, it “fit[s] your formal constraints,” whether that means play by forum or a 2-hour con game with strangers. It also “already create[s] the type of story you want to emulate,” meaning that if you want a coming of age story in space, pick a system that supports the coming of age part, rather than the space part. Thirdly, it “[has] useful structures you can capitalize on,” if you want to make a game with character classes, it makes sense to pick a game with character classes to hack. You can change out the names and use the underlying mechanic for your own purpose. System is the story structure of the gaming world. Maybe. In tabletop games, hacking makes a lot of sense, as most of them are built on some sort of “system.” System is a tool that shapes and supports narrative and story, but is not identical with it. To make an analogy to writing, I think system is rather like a story structure. In writing, although there are infinite ways to structure a story, we mostly stick to a handful–that handful truly taps into the collective unconscious or whatever it is we want to get out of reading. Narrative roleplaying games is a more recent phenomenon in human history–I’d suggest that these archetypal dynamics are still being discovered–but quite possibly, although there are infinite systems to create, only a handful of them will tap into that deep thing people seek from gaming. If, as Baker opines, all games are hacks of previous games, then maybe there’s no way out of being a hacker. But to me that lessens the meaning of the word “hack.” I do think there is a difference between the ends of the hacking spectrum, and I think stuff on the far end of the spectrum, stuff like Monsterhearts is more “inspired by” then “hacks of.” And yet, something about the hard use of mechanics in games I think of as hacks, such as Dungeon World, seems more than “inspired by,” I think? Maybe the way we use the term “hack” is just a little vague, like so much language. Maybe I’m drawing lines in the sand here, but I feel like this is more than a terminology argument, or a philosophical question like “how many grains of sand in a heap?”/”how many changes to make a hack?” After talking with many hackers, I have a better understanding of hacking’s siren song, but still haven’t quite wrapped my arms around it. Freeform design, the ship of Theseus and the skin suit. I think my problem might be my perspective. My experience comes from one-shot American freeform design, where a solid system for every contingency isn’t needed. Rather, freeform design relies on certain discrete elements that designers mix and match to produce the end experience. Sometimes, of course, just as in indie games, designers invent or discover new techniques along the way. To me, in good game design, each element is carefully constructed to add a particular thing to the narrative at hand, and the narrative at hand is pretty specific, as it’s been scripted by scenario designer. (Indie games are a bit looser since so many of them rely on a third party–the organizer or scenario writer as distinct from designer, to create the narrative.) Change the narrative, and you have to change the elements added. You can’t meaningfully hack a game like The Curse, because the structure of the game and the narrative fit together tightly and support one another–they’ve been crafted together–it’s a scenario not a system. On the other hand, there’s little in The Curse that is original aside from the premise, the experience delivered to players (maybe), and possibly the constellation of mechanics used. I borrowed many of the warm-ups and meta-techniques from other games, but I sewed them together into my own monster. Does that count as “hacking” or just inspiration and remixing? Perhaps, in the end, that’s my beef with “hacking”–to me it suggests derivative re-creation, and that offends my sense of self as a creator; but I’m unsure whether this is really a beef with the method or the term. You start with one thing and change it a little and then a little more and eventually your ship of Theseus is made of all new elements. Depending on the process, the new ship may look exactly as it began, or like wooden horse–something substantially different and only tangentially related to the original. This method is one path to creativity and new narratives, and it is a valid and worthwhile one, but it’s not mine. I prefer starting with my own concept and nipping a little off the pre-existing toes and heels until I can fit the foot into my shoe. Maybe, at the end of the day, that’s the choice and though the results may be indistinguishable, the process is different–do you want to tailor someone else’s suit to fit, or piece together a zombie skin that is then, uniquely, yours? I’m still forming my ideas on this topic, which means that some of this information is likely incomplete and I reserve the right to change my mind. Got opinions? Stuff I missed? Feel free to post in the comments. Like this post and want to read more like it? Become the Apocalypse World to my Monsterhearts by Patreonizing me! This entry was posted in Blog, Features, Larp and tagged American freeform, Evan Torner, game hacking, Graham Walmsley, indie games, Jared Axelrod, Jason Morningstar, Kira Magrann, Marshall Miller, Tim Rodriguez, Vincent Baker by Lizzie Stark. Bookmark the permalink. It’s a little weird to me how much you focus on the word “hacking” so much here, instead of moving past a term that’s overloaded and people have different strong positive and negative emotions tied into. I think there’s definitely a difference between a game like Dungeon World, that borrows many elements directly from previous games (Apocalypse World and D&D), and something like Numenera that definitely shows inspiration from other games (e.g., GM Intrusions are obviously based on Fate compels) but doesn’t really use anything from another game wholesale. That’s not to say that either is bad, but they definitely read differently. It’s a bit like the difference between reading well-written fanfic vs reading a story that’s inspired by a previous work, but has its own take. I’m not sure if I’ve played any games you’d consider “American freeform” (and with Intercon prep I haven’t had time to look at the pile of PDFs I just got), but I don’t think there’s something fundamentally different about them that makes them “unhackable”. Someone might play “The Curse” and be inspired by it’s unique elements to write a game with a very similar structure exploring a different topic and a different set of difficult decisions. That game would feel a lot like Dungeon World’s borrowing of Apocalypse World’s structure but dropping most of the scenario to me. I do think it’s cool how the LARP communities I’m involved with are generally supportive of borrowing, both of elements (structure, mechanics, play guidelines, etc.) from past games and of elements from outside LARP (fanfic and repurposing non-LARP mechanics). (Hey, I’m about to run a LARP that draws major inspiration from a previous LARP, a video game, and a tabletop system.) I think all this borrowing falls on a spectrum, so particular labels for different types of borrowing are going to be pretty arbitrary. As a creator in these post-modern times, I find the idea of originality tasteless. All creation is the adaption of existing ideas, regardless of how conscious you are of it. To me the point is how you choose to deal with the fact. Hacking such a wonderful way of approaching the creative process, it’s honest and open dialogue between the inspiring and the inspired. It’s credit where credit is due. It’s the sincerest form of flattery. It’s that your stuff resonated enough with someone that they not just enjoyed, but had to build further on it. It’s pluralistic. It’s loving the detail and finding a new whole, where it also fits. It’s approachable. It’s saying “Hey, you don’t need to do it all from scratch, you can join in on the fun with just a tweak.” It’s being both proud of YOUR work and sharing it at the same time, damn the proceeds. And it’s just plain old fun. Taking apart the games and seeing what makes them tick, not letting the way things are be enough. I’ve personally never done anything original, but I’ve remixed, remediated, adapted, fudged and most certainly hacked my way to every worthwhile creation I’ve done. Hey–not wanting to hate on hacking here. I think it’s great for people to undertake whatever creative process works for them. And if hacking works for you, great. There is nothing new under the sun. I think I’m wanting to draw a distinction between hacking and remixing. To me, hacking implies a more linear process of transformation, while remixing means piecing together something from elements you know work. The point about The Curse, or about freeform in general (I always know I’m getting into trouble when I use the words “in general,” but here goes…) is that it doesn’t have a strong system, but rather a set of elements pieced together to serve the story. As I say in the post there is almost nothing new in The Curse–I borrowed all of the metatechniques from other games and put them together in a constellation of classic story structure and characters I’d written. But I don’t think you can point to it and say it is a “hack” of say, Previous Occupants, which uses some of the same techniques because the lines of parentage aren’t all that clear. I think originality is overrated too. I think originality in form and system is overrated–novelty doesn’t excite me, but good stories do. And you don’t need novelty to tell a good story–we can do a lot with the tools we have. That’s why I make the point that system tools or mechanics are maybe a bit like classic story structures–it’s just that since gaming is a newer form, we don’t have thousands of years of tradition telling us which ones work and don’t–it’s the wild west out here. I think using stuff that works and discarding stuff that doesn’t is how the creative process works. But I think that’s different from making things that are derivative. I think when I started this post I thought of hacking as synonymous with “derivative,” because I hadn’t thought about it very deeply. Now I understand that there’s a lot of variety around what counts as “hacking” and that the term is slippery. Still, I want there to be lots of new great stories to experience, and I worry a bit that so much energy is going into derivative forms because they seem safe and approved or because people are afraid of taking risks. Making derivative stuff is part of the learning process, yes, and you can tell good stories with it, yes, but to me, creativity is tapping into your own original essence (we are all snowflakes!) and making that accessible to the world. I’m not sure you can do that if you are constrained by what other people think is acceptable. My point is that I really don’t see the point in trying to define a line of “this is derivative, this is original” in a fluid culture full of exchange back and forth, categorizing like that is not a thing that contributes to creating, thus it will always be secondary to the actual making. To me it feels like a way to feel superior through being better at hiding inspirations. I prefer the honesty of the hacking mentality. Also, in regards to freeform I chose to quote Vincent “It’s all system.” All the bits you made it from that direct the players is system. And it’s eminently hackable. One of my work-in-progress games is a hack of a Fastaval game, reskinned from medieval times to the eighties. I think Vincent’s definition is overbroad and makes “system” into a concept that’s not real useful. An old creative writing exercise is to take the core dynamic of a story you love and revisit it in your own way. Sometimes they end up reading as workshop exercises; sometimes they take on lives of their own and become works in their own right. Since people seem to agree that everything is hackable, I knew I’d get into trouble saying that you can’t hack freeform. Still, I think that keeping the same core dynamic but re-skinning something like a freeform game probably changes the point of the game considerably (hard to know, though, without knowing more about the game). My question would be: why do you want to set it in the 1980s and what are you trying to say by doing that? Are you trying to say anything, or just want a similar cool story set in an era you like better? What is gained by the re-setting? This is where we get into ship of Theseus land–how many alterations change a hack into its own thing (or maybe this is not a useful distinction)?–which is a philosophical quagmire.